Watershed council will take your Christmas tree and put it in the Willamette River for fish habitat. Willamette River salmon will be celebrating Christmas long after the holiday ends. If it's too painful to chuck your Christmas tree with the yard debris now that the season is over, consider recycling it for fish habitat instead. Bring your tree to North Clackamas Park, 5440 S.E. Kellogg Drive in Milwaukie, on Saturday, Jan. 12, between 10 a.m. and 2 p.m. There's a $10 recycling fee. 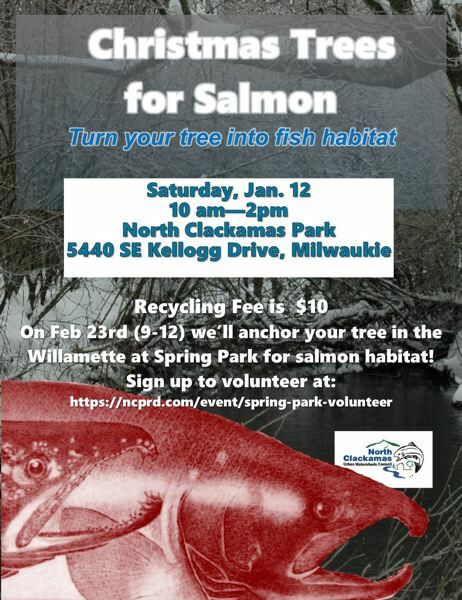 Then on Feb. 23, the North Clackamas Urban Watersheds Council will anchor the tree in the Willamette River at Spring Park to create habitat for salmon. Due to issues with invasive species on some Christmas trees bought at big-box stores that can spread to Northwest forests, please don't bring any trees purchased from big-box retailers, or any Fraser firs. They'd spread contaimination if put in the creek. The watershed council also is hosting a volunteer tree planting on FThe watershed council also is hosting a volunteer tree planting on Feb. 9, from 9 a.m. to noon, at the Three Creeks Natural Area, 7300 S.E. Harmony Road in Milwaukie.